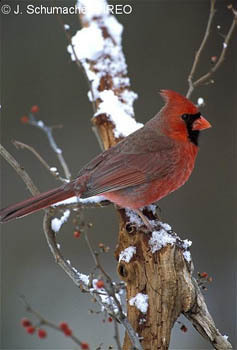 The Northern Cardinal (Cardinalis cardinalis) is the most conspicuous common bird in backyards in the eastern United States. The bird takes its name from the bright red robes worn by the Roman Catholic College of Cardinals. Throughout the twentieth century the Cardinal expanded its range northward as open suburban plantings replaced deep forests and bird-feeders provided winter sustenance. The male Cardinal showcases its handsome plumage by selecting an exposed, sunlit branch or wire from which to broadcast its loud whistled phrases: "tchew, tchew, tchew" or "purdie, purdie, purdie". The female Cardinal is distinctive in that it sings a full song as well as the male, and both sing, to some extent, even in fall and winter. The Cardinal's strong metallic "chip" note also marks this bird's presence. The range extends east of Colorado and north from the Yucatan Peninsula in Mexico to Nova Scotia. The Cardinal can also be found in portions of southern Arizona and New Mexico, in San Bernardino and Los Angeles, California, and in Hawaii. The Pyrrhuloxia of southwestern United States and Mexico is distinguished from the female Cardinal by its grayer color and rounded, stubby yellow-gray bill. Seeds and fruits from the dogwood and similar trees and shrubs form the bulk of the Cardinal's diet. The bird peels grapes and discards the skins, and it feeds beetles to its nestlings. Carotene in its fall diet apparently contributes to the feather coloration. The Cowbird is a major predator, ejecting the Cardinal's eggs from the nest and laying its own. Also, cats and dogs take Cardinals.